Perfect for Oktoberfest (or Any-fest! 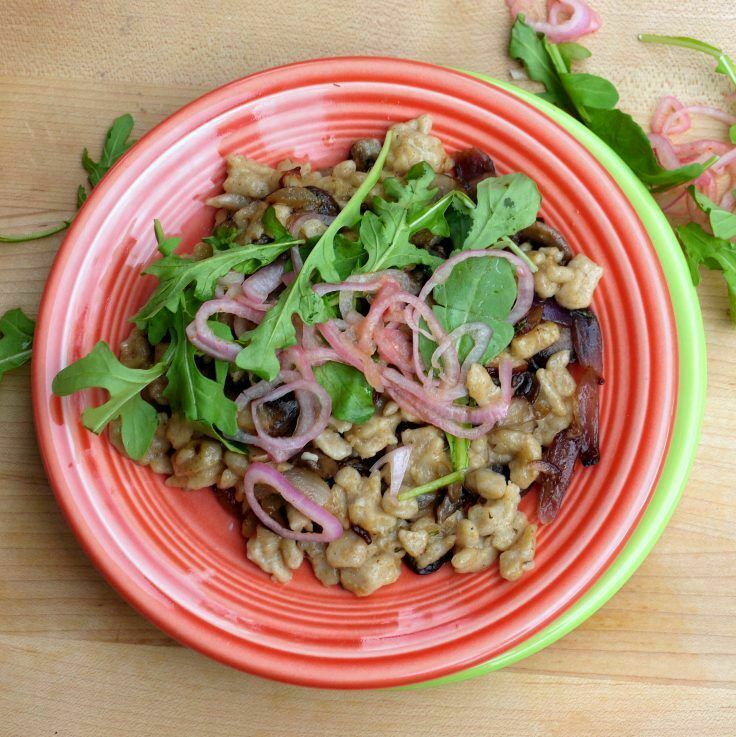 ), the recipe for this amazing Rye Sourdough Spaetzle – with Caramelized Cipollini, Sauteed Mushrooms, and Tabasco Shallots – comes to us courtesy of Chef Ryan Mead of Portland’s Bent Brick. I’ll be honest: I’ve been holding on to this recipe for almost two years now because I wanted to run it during Oktoberfest season. This amazing dish, which I first sampled while on a Portland Food Blogger Progressive Dinner, was created and generously shared with me by Chef Ryan Mead of The Bent Brick in Portland. Chef Mead’s recipe was made to feed a multitude, so I’ve adjust both amounts and process to better suit home cooks. There are a number of steps to this recipe, but it goes together surprisingly quickly, and the results are outstanding. If you try it once, it is sure to become an annual Oktoberfest (or Any-fest) tradition. Once you are ready to make the rye sourdough spaetzle batter, just follow the easy workflow found at the bottom of this post. It takes just 30 minutes from stovetop to table! Put the pan of water to cook the spaetzle in on the stove on high. 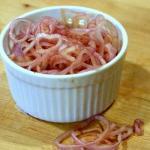 While the water is heating, slice the shallots and and toss in Tabasco-vinegar marinade. Cut the cipollini into petals and begin sautéing. Complete both sauteed mushrooms and caramelized cipollini and set aside to cool. When the water has boiled, begin cooking the spaetzle. Quick-cool spaetzle in ice bath and drain. 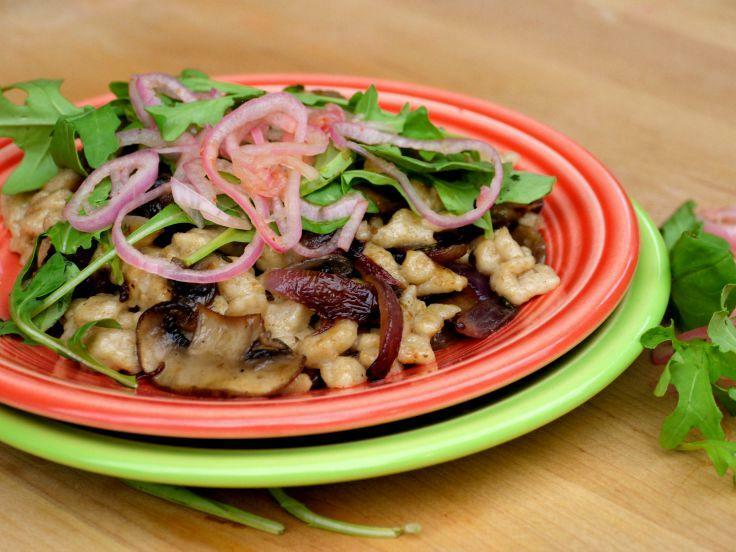 Toss with sauteed mushrooms and caramelized cipollini, garnish with arugula and Tabasco shallots and serve. I do hope you will take the time to make this fabulous dish, and once again, thanks to Chef Ryan and The Bent Brick for their generosity. An uptown spin on a traditional German noodle dish. In a mixing bowl, combine the starter, whole egg, egg yolk and salt. Mix on low speed until the eggs are combined. With the mixer running slowly add the flour. When the flour has been fully incorporated place the mixer on medium speed and whip for 3 minutes. 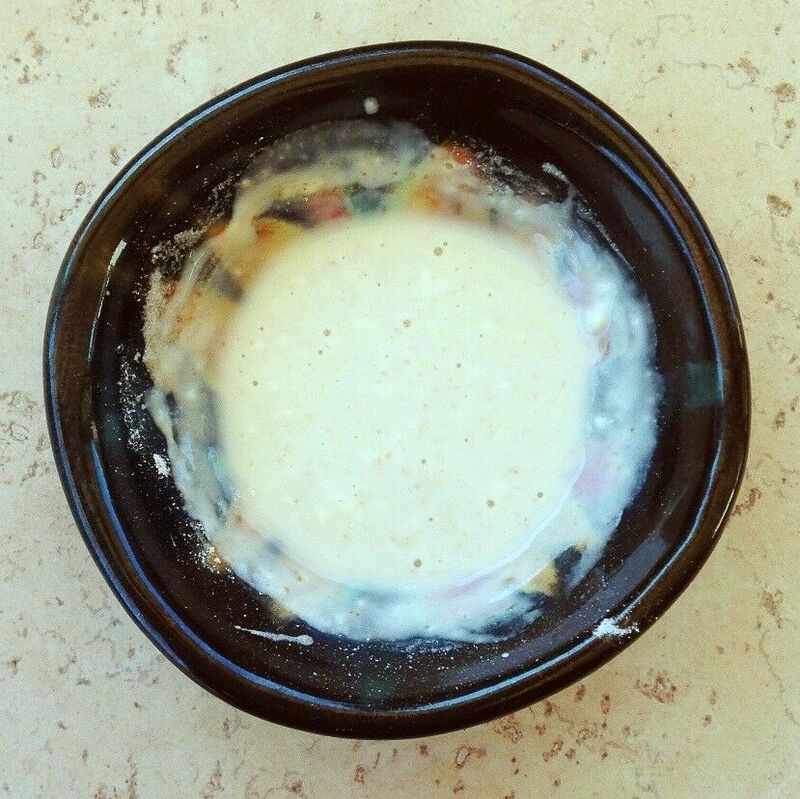 The batter should be the consistency of thick pancake batter when you are done. Don't overmix. 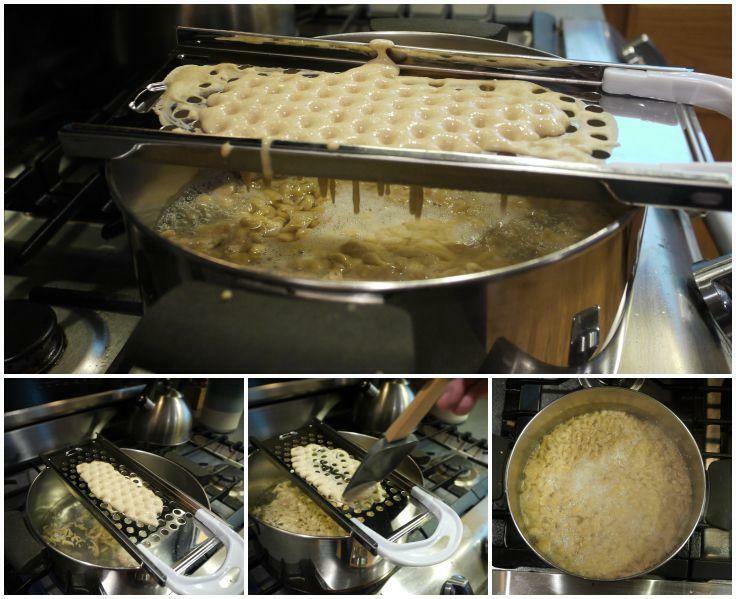 Using the spaetzle making tool of your choice, add batter to the boiling water a little at a time. Do not put too many noodles through the spaetzle tool at once or they will clump together and get gloppy. Place cooked noodles in a colander and run them under cold water (or better yet, throw them into an ice water bath) to stop the cooking process. Set aside and continue process until all noodles are cooked. 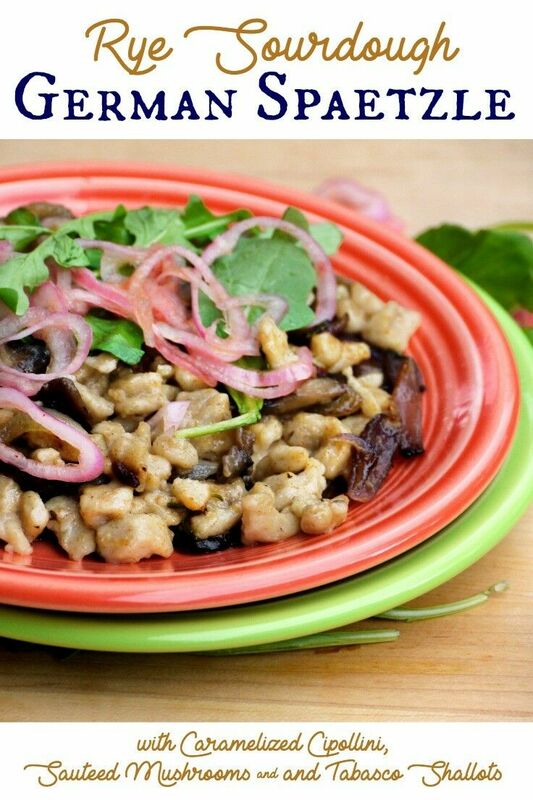 Toss cooked rye spaetzle with prepared caramelized cipolini and sauteed mushrooms. Garnish with Tabasco Shallots and arugula, Serve warm. Melt the butter in a medium skillet over medium-low heat. When the butter begins to slightly brown, add the cipollini and cook over medium heat until they caramelize, about 15 minutes. 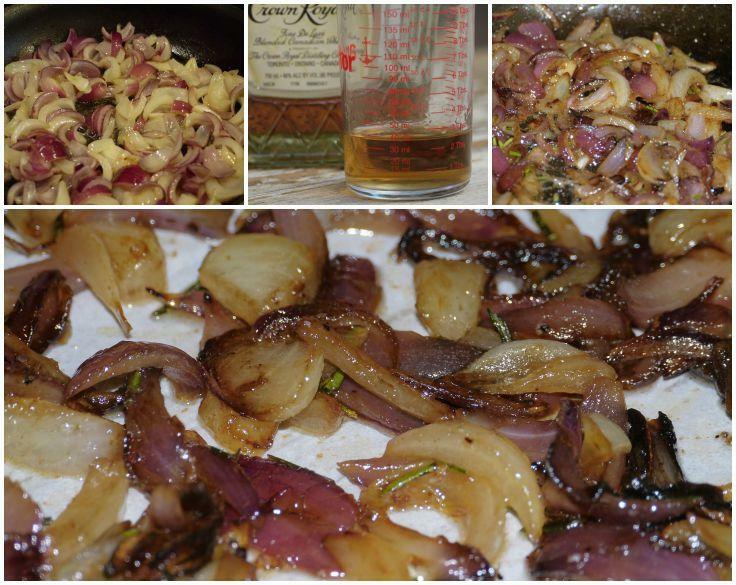 Once the cipollini are caramelized add the bourbon and picked thyme. Cook for an additional 3 minutes. Place the cipollini on a parchment lined sheet tray and cool. Cipollini (pronounced chip-oh-LEE-nee) are small, flat, pale onions. They are sweeter and have more residual sugar than garden-variety white or yellow onions, but not as sweet as shallots. Their shape lends them well to roasting, and their sweetness makes a lovely addition to recipes that include caramelized onions. If you look closely at this picture, you might be saying, “Hey! That doesn’t look like thyme in there, Renée!” Well, you’d be right. I decided to put in some rosemary instead, and guess what!?! Loved it! That’s what home cooking is all about – taking a recipe and making it your own! Cipollini are harvested in the fall, but can be somewhat difficult to find the rest of the year. 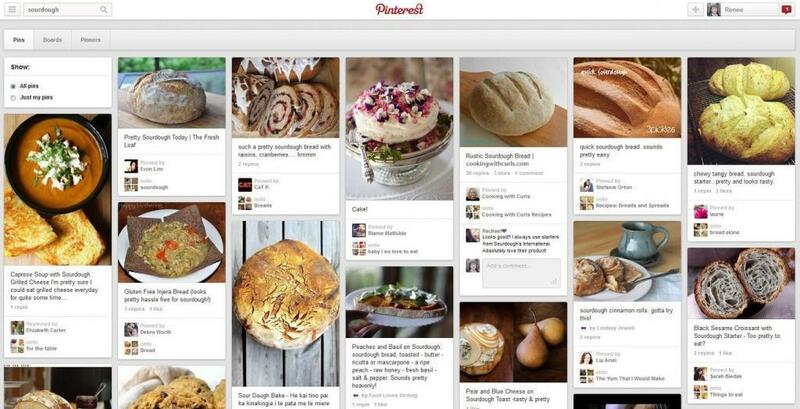 You may be able to find them in specialty markets or Whole Foods. (I found mine at New Seasons.) 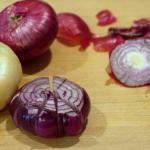 If you can’t find them (or don’t want to bother) simply substitute a sweet onion for this step. Heat olive oil in a medium skillet over medium-high heat. Add the minced garlic and sauté for 30 seconds. Add sliced mushrooms and sauté, stirring with a wooden spatula and keeping them moving until they are dark brown, about 5 minutes. Season with salt and freshly ground pepper to taste. Set aside. Toss ingredients in a bowl. What’s on your Oktobestfest menu? Rye sourdough starter is – by far – the easiest sourdough to start. All you need is rye flour and water. I have a confession to make: I’ve been holding out on you. For nearly two years, I’ve had an amazing recipe in my [digital] back pocket that I’ve been so excited to share, but it kept getting bumped for one reason or another. I’d have it scheduled, and then something else would come up and I’d think,What’s another week? or, I really want to run this one during Ocktoberfest season. Well, Oktoberfest season is upon us once again, and I am not letting it get by me this time. Two years ago this fall, I went on an absolutely fabulous party-bus ride with some of Portland best food bloggers for a progressive dinner at four of Portland’s most esteemed restaurants. Our main course came courtesy of The Bent Brick in northwest PDX, and among the dishes served was the best spaetzle I’ve ever eaten – made with rye sourdough and dressed with caramelized cipollini [fancy-pants onions], sautéed mushrooms, and Tabasco shallots. 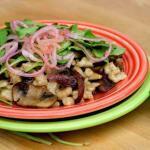 If there is German pasta in heaven, it tastes like The Bent Brick’s rye soudough spaetzle. I’ll be sharing the complete recipe next week, along with many [belated] thank you’s to those who helped bring it to us. But first, there’s a little prep work to be done. In order to make Rye Sourdough Spaetzle (or rye sourdough bread, or rye sourdough pancakes, etc.) you need to put together a rye sourdough starter, which is – by far – the easiest sourdough to start. 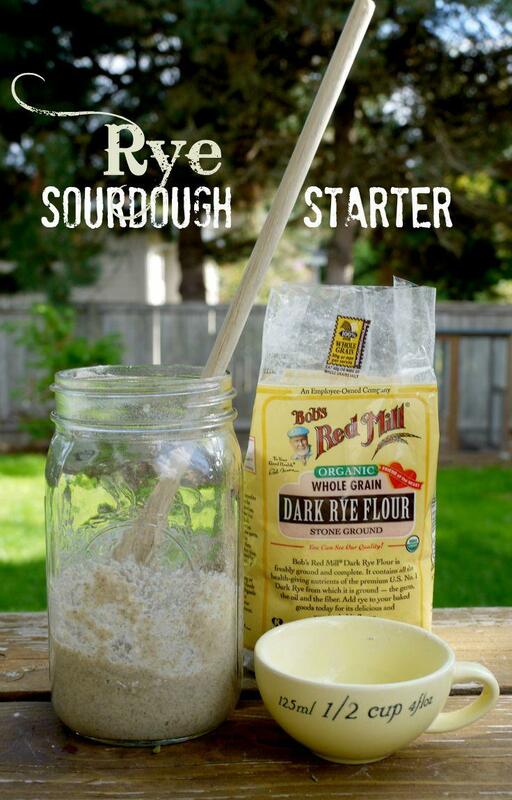 All you need is rye flour and water. The Flour: I used Bob’s Red Mill Organic Dark Rye Flour. The Water: I used tap water, and everything bubbled up just fine. 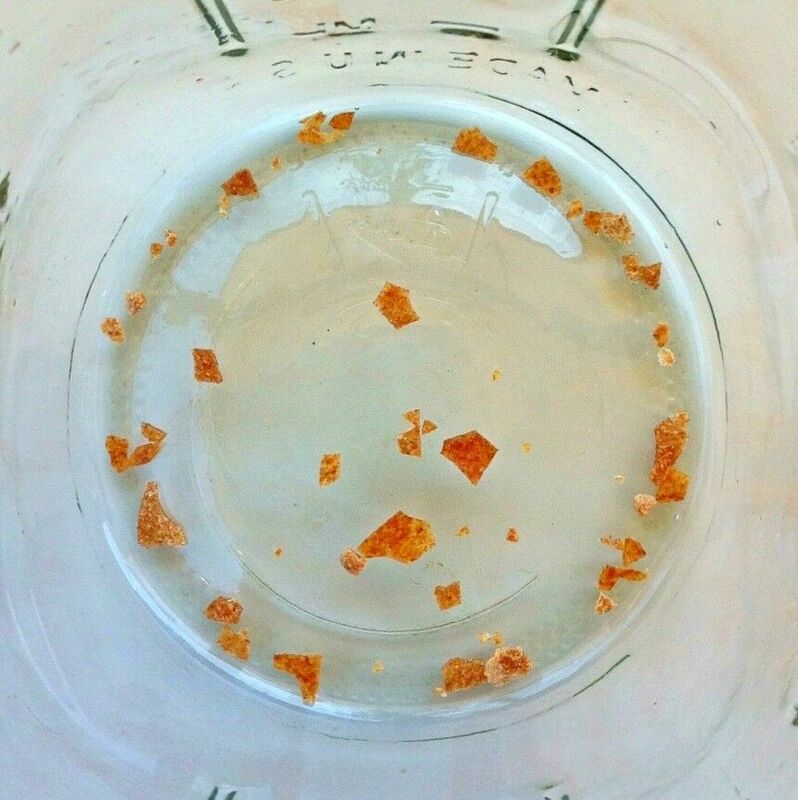 Nevertheless, many sourdough professionals (I am not one) discourage the use of tap water in favor of distilled water, as the chlorine and other chemicals found in treated water can kill the microorganisms that need to flourish to create sourdough. If there is an overabundance of chlorine in your city’s water, you might want to think about using distilled water. All I can say about the issue is that the water treatment facility in my town uses enough chlorine that I can actually smell it when it comes through the faucet, and it wasn’t a problem for me. Just use your best judgement. 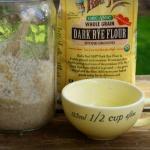 Using a wooden spoon, mix the rye flour and water in a mason jar or non-reactive bowl. Add the rye flour and water to the starter. 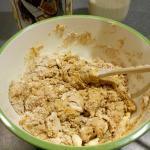 Mix with a clean wooden spoon for 30 seconds until the flour has been incorporated. Cover loosely and place in a dark place at 70°F for 24 hours. If bubbles have started to form and the flour has begun to ferment discard ⅔ of the mixture. Add the flour and water to the remaining ⅓ and mix for 30 seconds until the flour is well incorporated. If the mixture has not started to ferment repeat step 3. The starter should be mature by this point and is ready to use. Use the starter you need. After use, see feeding instructions. After each use of the starter, mix in the flour and water just like Day 4, with the exception of discarding any starter. Let the starter rest in a dark 70°F place for 12 hours and then place in the refrigerator. Disclosure: This post may contain affiliate links, which means we may receive a commission if you click a link and purchase something that we have recommended. While clicking these links won’t cost you any extra money, they do help keep this site up and running, and at the same time allow us to keep traditional advertising to a minimum. As always, all opinions and images are my own. Please check out our disclosure policy for more details. Thank you for your support! I have a dirty little secret: I don’t feed my sourdough starter regularly. At all. Mostly it just sits in a jar in the back of my fridge under a little puddle of hooch, waiting for me to get a yen to make something sour-doughy. My sourdough use waxes and wanes in bouts that can last weeks, or even months. In waxing cycles, when I am baking bread nearly every day, a loaf rarely hits the cooling rack before someone slices off an end. We have homemade bread for our sandwiches and for our soup. We take it in our lunches and feast on it warm with slathers of peanut butter and sprinkles of sugar. 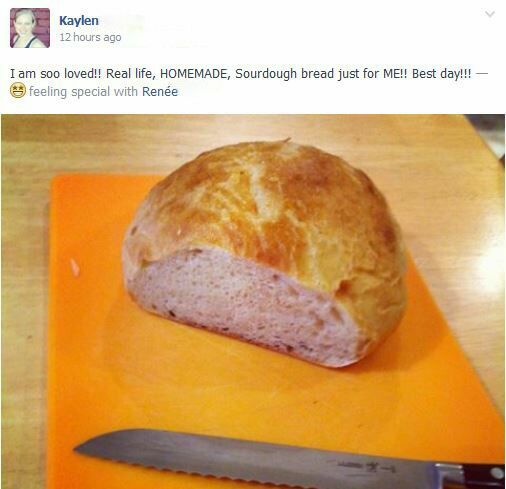 I know good sourdough parents don’t have this problem. They feed their starter regularly, and they bake a loaf every three days like clockwork. This post isn’t for them. It is for the rest of us. The negligent. The lackadaisical. The throngs of home bakers who avoid sourdough altogether because they instinctively know that the waning times will come to them as well, and they just don’t want to deal with the guilt. 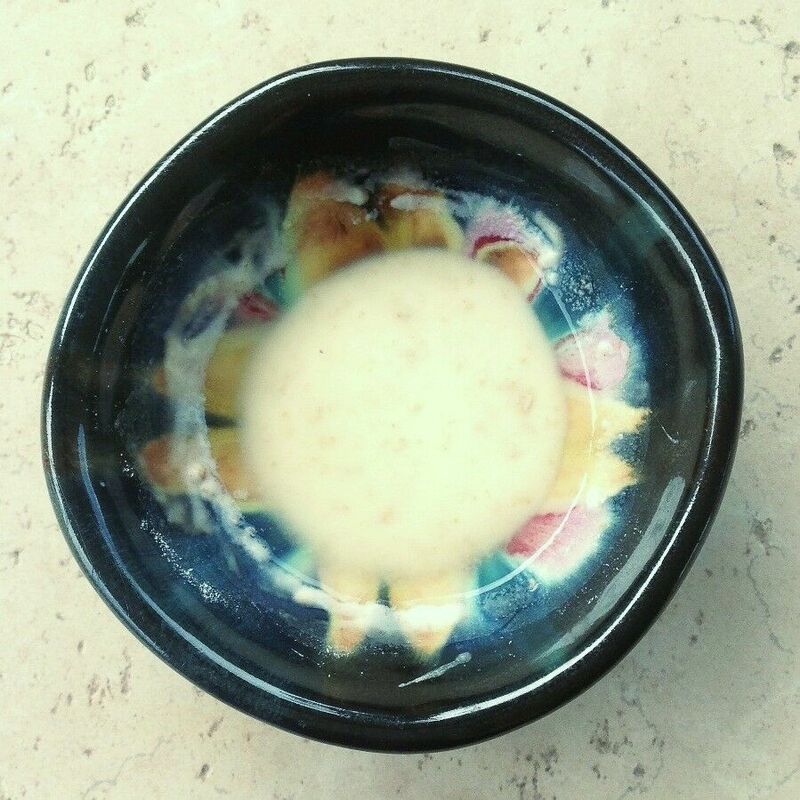 Put one tablespoon of starter into a non-metallic bowl. Stir in one ounce each of filtered water and flour. (I use a kitchen scale.) Allow to sit at room temperature for 8 hours. After 8 hours, measure the starter (preferably on a kitchen scale). Add equal parts filtered water and flour. (i.e., If I have 2 ounces of starter, I add 2 ounces each of water and flour.) Let sit at room temperature for another 8 hours. The total “revival” process takes about 24 hours, at which time my starter is usually bubbly, percolating and ready to use. If yours isn’t, try one more feeding and check again. Mix one cup of filtered water and one cup of flour into the cup of old starter. Put everything in clean jar,* cover loosely, and put it in the back of the fridge. *I use antique jars with ill-fitting ceramic-lined lids: they do the job perfectly! A final note for all you Lifetime Sourdough Bakers out there who tend your starter regularly and have likely cringed your way through this entire post: Please be kind in your comments. We all know that this is not the optimal way to take care of sourdough starter, but it works for me, and I know there are plenty of bakers just like me out there. 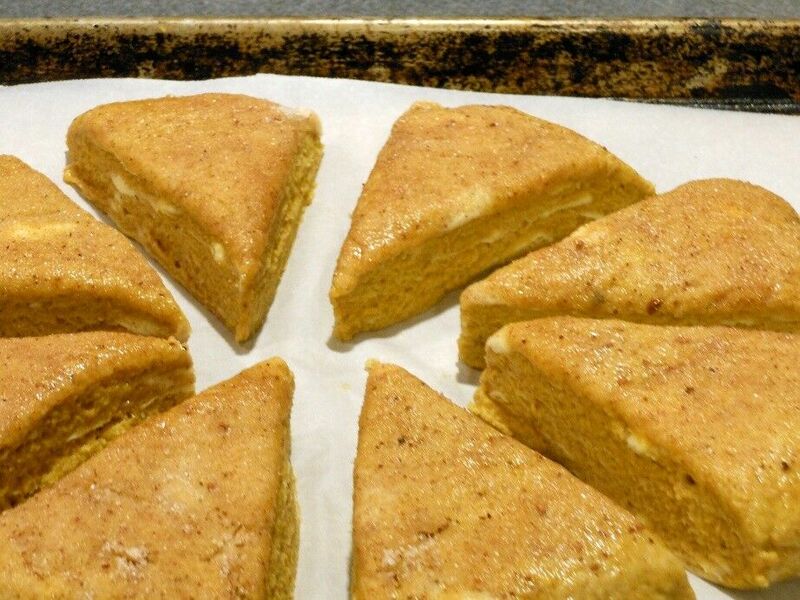 The only thing better than the warm, spicy scent of these Sourdough Pumpkin Spice Scones baking is taking a bite of one fresh from the oven. National Pumpkin Spice Day happens every year on October 1st, unofficially ushering in what has become known as Pumpkin Spice Season, or the period of time that stretches from the moment the first leaf falls each autumn until crack of dawn on Black Friday. To be honest, while I appreciate a good pumpkin spice latte as much as the next person, I’m usually just not that into the pumpkin spice seasonal frenzy. I mean, I know it’s delicious and all, and makes you feel all cozy like you’re visiting your favorite Gramma and she has fresh, warm cookies waiting for you when you get there. I get that. But do we really need Pumpkin Spice Pringles? Or Pumpkin Spice Pet Cologne? I don’t know. You know what Pumpkin Spicy thing you do need though? 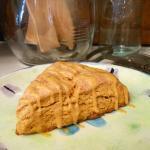 You need these Sourdough Pumpkin Spice Scones. Because they are Super-Delicious. Plus, while they’re baking, your house will smell warm and cozy and utterly spectacular. Kind of like visiting your favorite Gramma. 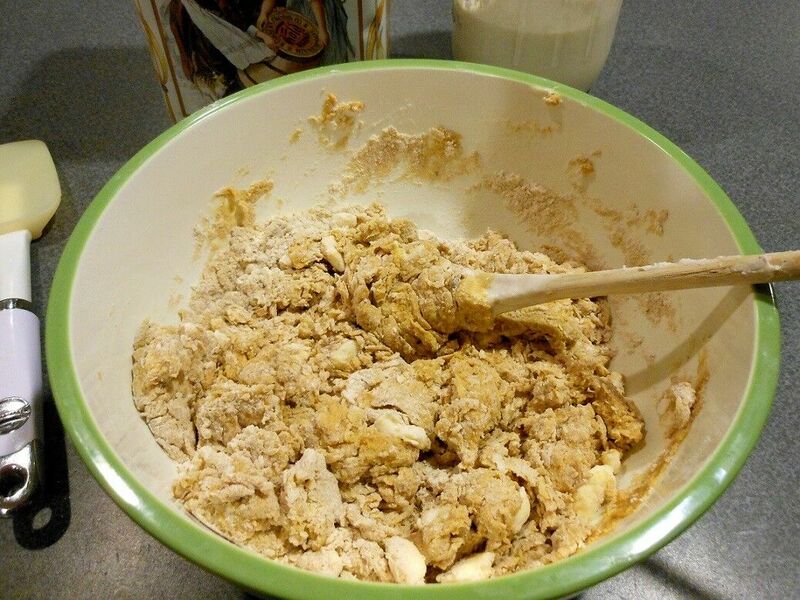 Stir together flour, brown sugar, pumpkin pie spice, cream of tartar, baking soda, and salt in a mixing bowl. Cut the butter into ¼ cubes and blend into dry mixture with your fingertips or a pastry blender. It should look like very coarse crumbs with a few bigger pieces of butter distributed throughout. In a separate bowl, mix sourdough starter, pumpkin, molasses and vanilla. Stir wet mixture into dry mixture. This may seem a little dry at first. Mix thoroughly before you decide to add the milk. The dough should soft like a biscuit dough. 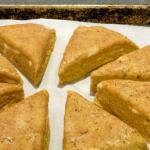 Don’t play with the dough too much – the less you work with it, the tenderer your scones will turn out. Form a 9-inch wheel of dough. With a long knife, cut it into eight pieces, like a pizza. Brush the top of the wheel with milk. 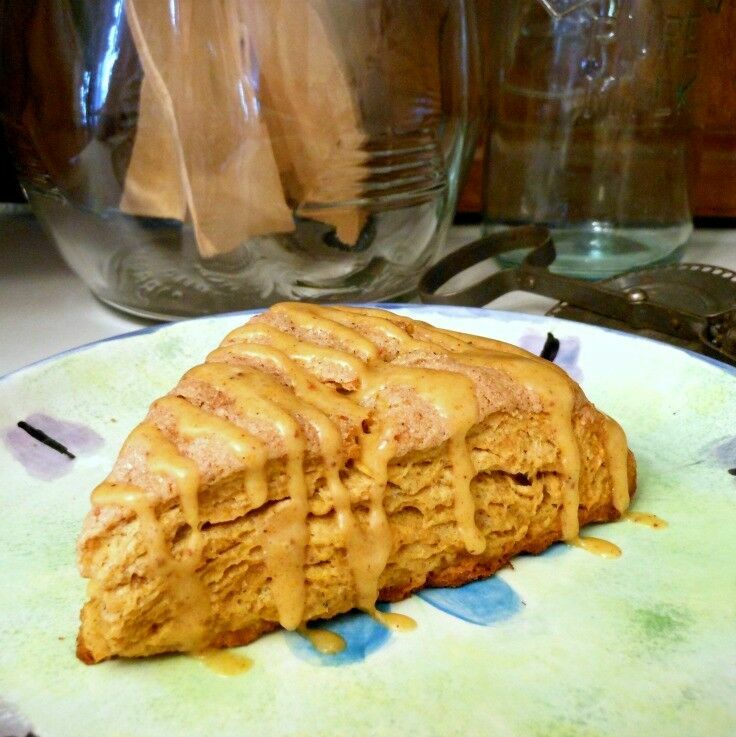 In a small bowl, combine the white sugar with ½ teaspoon of pumpkin pie spice and sprinkle this mixture over the top of the scone-wheel, using your fingers to smooth it evenly. Cut the wheel into eight pieces, like a pizza and transfer them to the prepared baking sheet. Place them so that they are about ½ inch away from one another. 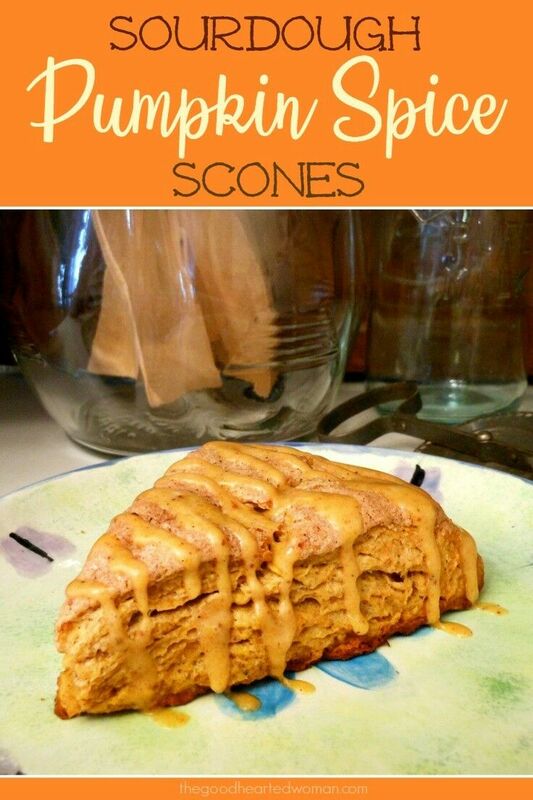 Put the scones on the baking sheet in the freezer, and set your oven to 400° F.
When the oven is heated, take the scones out of the freezer, put them into the oven, and bake for 20-25 minutes. Cool on wire rack and drizzle with Pumpkin Spiced Glaze. **You can use home-cooked pumpkin, but you may need to add a little milk or extra flour to the mix to adjust for the difference in moisture content. It’s OK if your kids eat Cheerios for dinner now and then, or if your vintage reclaimed antique table is really a Pottery Barn knock-off. It’s OK if your house is a mess and you don’t know how to crochet your own swimsuit cover-up. You don’t have to be perfect, and you don’t have to Monkey-Shop every image you put up on the interwebs so that it looks like you are. OMG I wish you could hear me. In fact, you can even miss a day or two of Vegan MoFo and everything will be just fine. Yes, I promise. Everything will work out fine. So none of this has anything to do with Sourdough, which is probably why you stopped in, but I just felt like I needed to get that out. 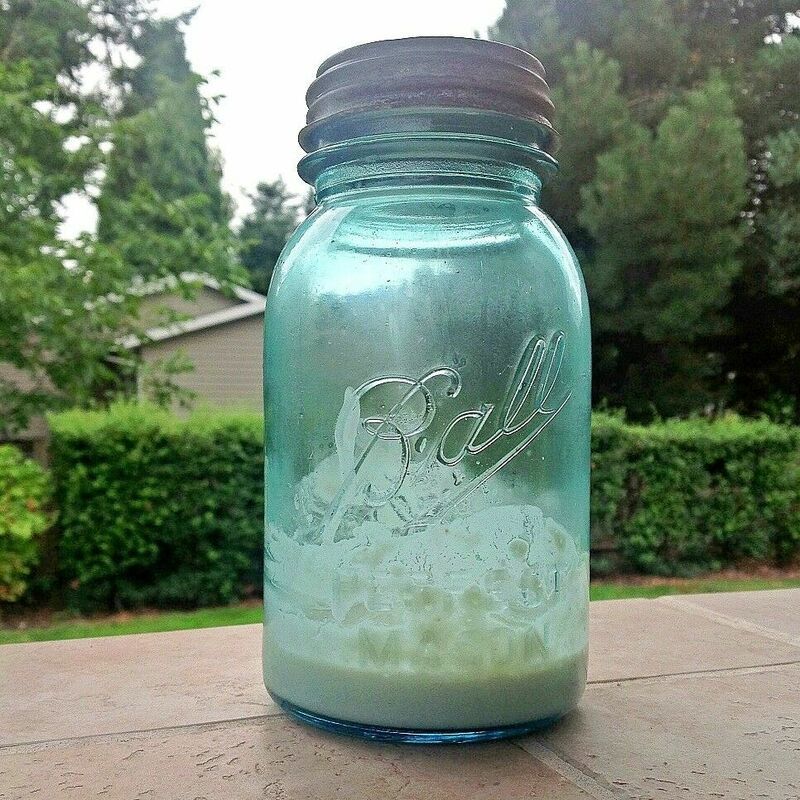 Now let’s get back on track with this: For the last month, I’ve been posting weekly about starting up a sourdough starter, and it occurs to me that you might be asking where to get sourdough starter. There are a couple of places, but the two easiest and least expensive ones I know of are (a) a friend with sourdough starter who will share, or (b) The Friends of Carl Griffith. For the price of postage, Carl’s Friends will mail you a little package of flakes in about six weeks (mine came in three). 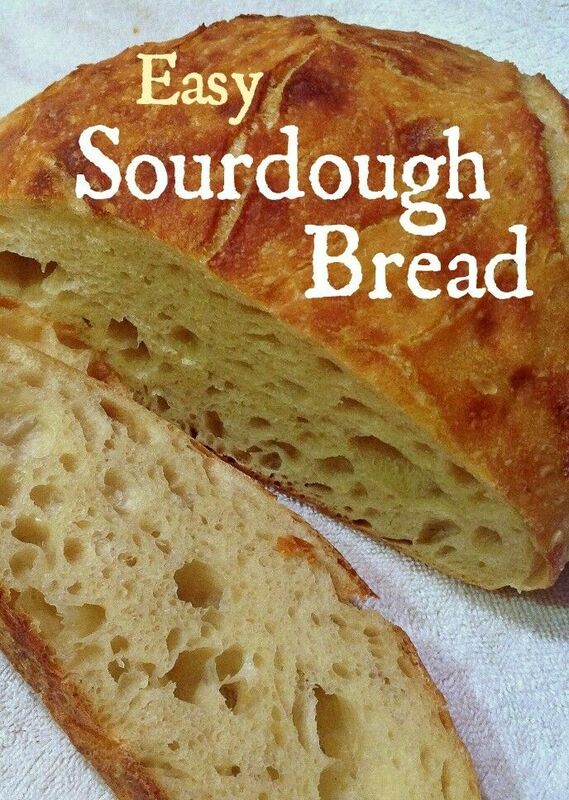 This Thursday, I’m planning to make my first loaf of sourdough bread and I’m pretty excited about that. I’ll let you know how it goes, if the lighting works out right, that is. Back when I was a little girl, somewhere between Mr. Ed and Charlotte’s Web, I fell in love with the name Wilbur. I’ve always wanted to give the name to a pet, but I’ve never had one for whom it seemed right – until now. 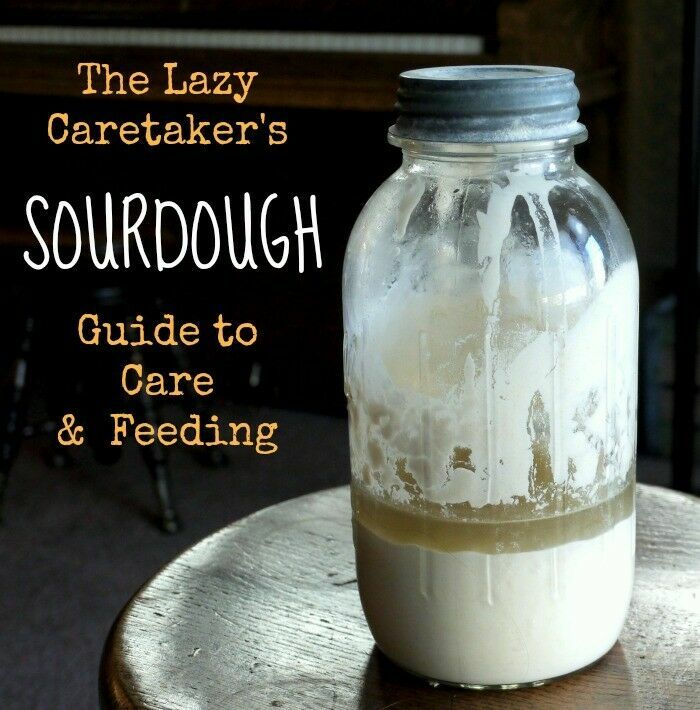 You see, according to all the sourdough people I’ve read, maintaining a sourdough starter is kind of like keeping a pet, in that it requires ongoing care and attention, regular feeding, a certain amount of air, and a clean, comfortable place to live. So I’ve named my starter Wilbur. I just thought you should know. Day 8 – Not as many bubbles today, and I’m wondering if maybe I need to feed Wilbur more. Normally on feeding days, you are supposed to add enough to double your starter. For example, if you have a cup of starter, you are supposed to add a cup of water and a cup of flour. But with these small amounts, I’m not sure I should be doing that – I’m still concerned about overwhelming those little critters – so I add 1 teaspoon of water and one teaspoon of flour. 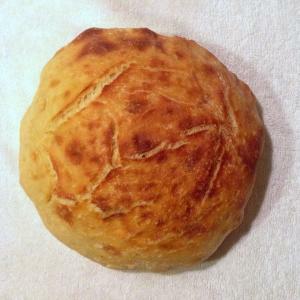 Day 9 – Smells like sourdough. Not much happening though. Day 10 – No activity, so I decide it’s time to feed him again. For the first time, I double the amounts, adding one tablespoon of flour and one tablespoon of water. One hour after adding 1 T. water and 1 T. flour, my starter is happily bubbling away! Day 11 – Not much happening. Bubbles are confined under a thin layer of water. Day 12 – Remember that scene in Charlotte’s Web where Fern has to move Wilbur out of the house and into him pen in the yard? That was today. Wilbur is finally big enough to move to a new home – a vintage canning jar with a very loose lid. I moved him, fed him and said a little prayer. From now on, I am going to try to feed him every Sunday and Thursday. Wilbur is getting settled in his new home. Day 13 – Bubbling away in the fridge! Day 14 – Still bubbling! Day 2 – No changes. None. Day 3 – Still no changes. I start to get a little worried. Maybe I put in too much flour. Maybe there’s too much water. Maybe I should have put it in the fridge. Maybe it needs to be warmer. Even though there is a ton of flour in there, I sense that I need to feed it, so a put in another 1/4 teaspoon of flour. Day 4 – No changes, except I am worrying more. Day 5 – I “think” there is something happening! Just maybe. No visible changes yet, but it just feels different. 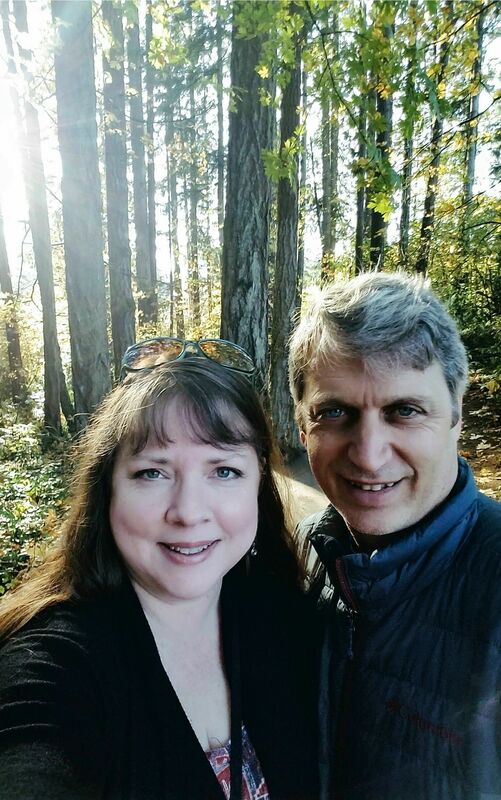 Day 6 – Yay! I can see tiny little bubbles!!! I think it is possible I have not killed it! I am so excited!!! I am supposed to feed it every 3-4 days, so I add another 1/2 teaspoon of flour, but no extra water. 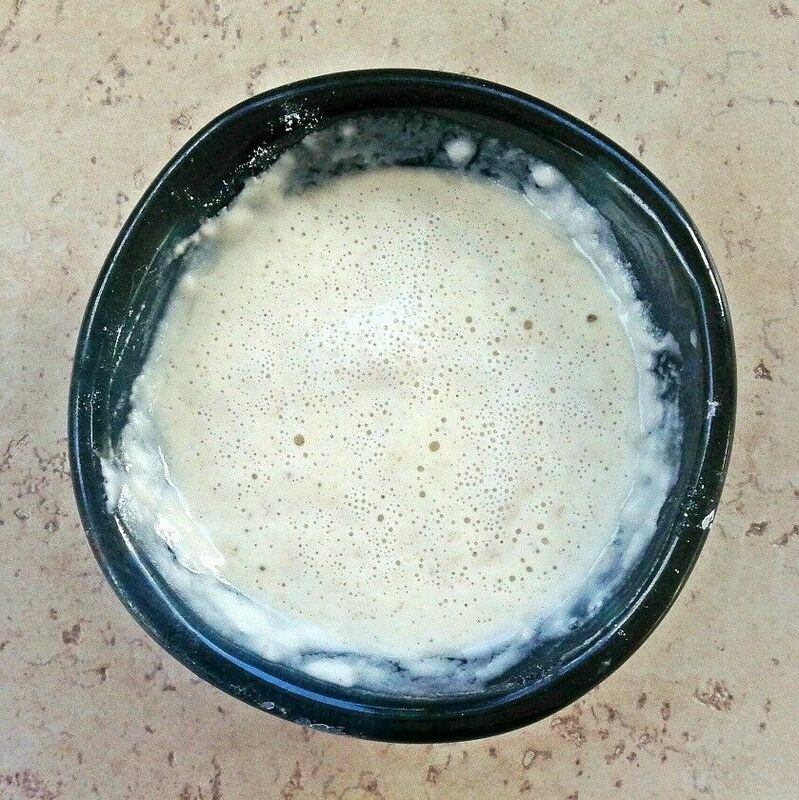 Sourdough Starter – Day 6, before adding more flour. Day 7 – More bubbles! And even more exciting, my little bowl of starter is starting to smell like sourdough!! Oh, I am so exited! Day 7 – More bubbles!! 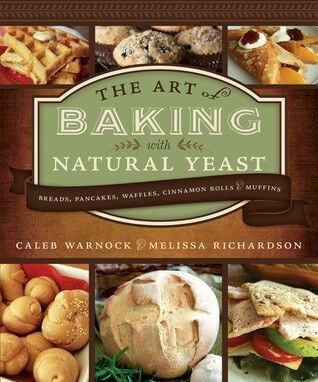 A while back, my BFF Jenny gave me a copy of “The Art of Baking with Natural Yeast,” a book all about starting and using “sourdough starter” in baking, by Caleb Warnock & Melissa Richardson. The premise of the book is simple: the authors claim that “commercial yeast is so foreign to our bodies that many people are allergic to it. But natural yeast converts dough into a digestible, vitamin-rich food that’s free from harmful enzymes and won’t spike your body’s defenses.” They explain that almost all yeast used today was created in a lab, stating “for the first time in 6,000 years, humans are eating bread that is not made with natural yeast.” In other words, according to the authors, it isn’t the gluten that is causing so many to develop Celiac and other related digestive diseases; it is the synthetic yeasts that we ingest that are predisposing our bodies to gluten intolerance. Jenny gave me the book because she has a daughter who has some pretty severe gluten intolerance issues and she is curious if the nutritional claims hold up in real life, but she’s just not a bread baker (her words), so she asked if I could pretty please help. Well, I’m not a great bread baker either, but I’m eager and willing to learn. And really, taking a crack at keeping a sourdough starter wasn’t a very difficult decision for me to make – first, I would walk barefoot through a fiery hot pool of bubbling butterscotch for Jenny; and second, I’ve always wanted to try sourdough from the ground up: My mother kept a sourdough starter when I was very young, and the pancakes and bread she used to make for us is are a wonderful food memory for me. Honestly, I wish I could just write out giant chunks of Caleb and Melissa’s book – they’ve done their homework, they outline their hypothesis well, and frankly, it makes a lot of sense. But I’ll leave that to you to read if you wish and draw your own conclusions. Here, I’m just going to concentrate on sharing the natural yeast (i.e., sourdough) process – and hopefully some wonderful recipes – with you. To aid readers in the process, when you buy the book, Caleb will mail you dry sourdough starter for the price of a self-addressed, stamped envelope. (That’s a SASE, for you aging Zoomers.) I mailed my request off and had these little babies in hand a week later. They look kinda lonely all by themselves in that great big jar! The directions in the book say that I need about one tablespoon of starter to “get started,” but Caleb only sent me about ½ a teaspoon, so I’m just going to push through and see what happens. I also consulted these great directions for reviving Sourdough Starter at Yumarama, and I’ll update you on the progress next week on Sourdough Tuesday.